There are many places in Australia with great wildlife, and many wildlife and bird photographers. So creating satisfying wildlife photographs while you travel takes more than good equipment. Knowledge of the animals, patience and timing can create opportunities to capture a special moment. Travelling with a Wildlife Guide helps. They have local knowledge of animal behaviour – where to find them, what they might do next. In addition, wildlife tours tend to occur in destinations known for reliable and diverse wildlife sightings. Kakadu and Mary River National Parks, in the Top End, Northern Territory is a perfect destination for wildlife photography. In the Top End species diversity is high, good populations of mammals, reptiles and birds exist, and backgrounds are spectacular. I am not much of a photographer, but I love wildlife photographs that capture expression, emotion or interaction between species. My job as a Wildlife Guide is to get my guests into the best position to take magic wildlife photos. 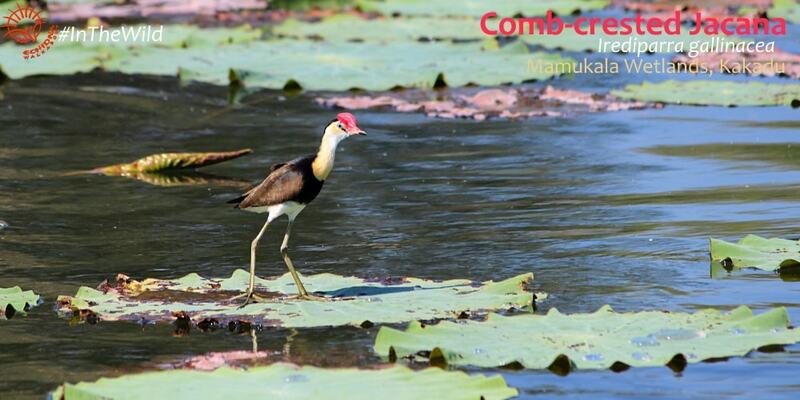 On a recent Wild Top End tour we visited Mamukala Wetlands in Kakadu in the late afternoon. There is an excellent bird hide and boardwalk overlooking a billabong. We spent half an hour inside the cool interior of the bird hide, photographing and identifying dozens of bird species, laughing as we tried to count the egrets: 600….700… ooops, lost my place AGAIN! As we prepared to leave, I peeked out the doorway quietly, to find an Agile Wallaby joey within metres. Perfect! Nearby was her mother, and a male. As I had hoped, the half hour we had spent hidden inside had allowed the marsupials to invade the floodplain undisturbed. Back inside, I informed the group. Together, quietly, we crept out the door and onto the boardwalk. The wallaby joey saw us, but continued to feed. She was hungry, and had seen people up on that boardwalk before. Her beautifully-expressive pink ears flicked, catching the low sunlight. Click-click-click-click from expensive cameras. 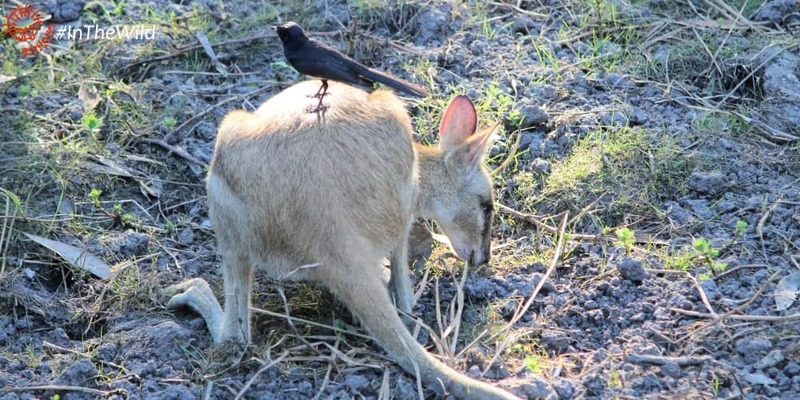 A Willie Wagtail hopped into view, and started to search for insects beside the mammal 600 times his size. Her tail, nicely rounded like a branch, provided an excellent perch. The wallaby turned one glowing ear towards the bird. Better still, her broad furry back would give him a height advantage. Up he flew. The wallaby lifted her head slightly, seemed to smile, then returned to her meal. 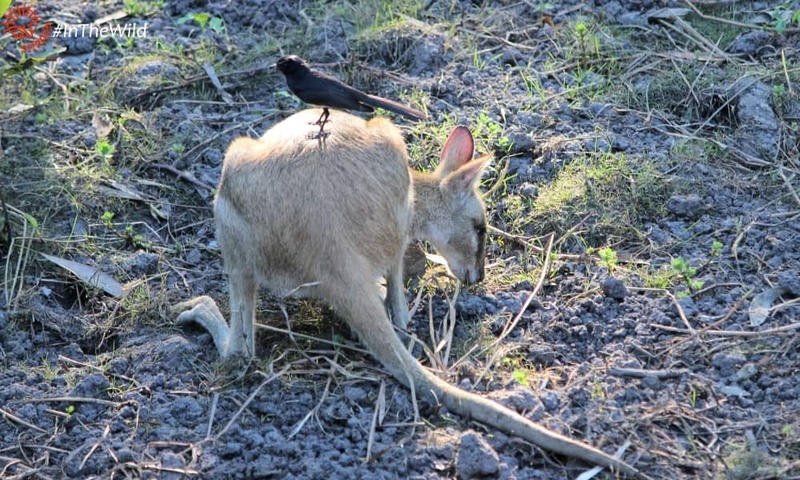 The wallaby and the wagtail seemed to be on good terms. They live in similar habitats, but don’t compete for food – she is a vegetarian and he is an insect-eater. 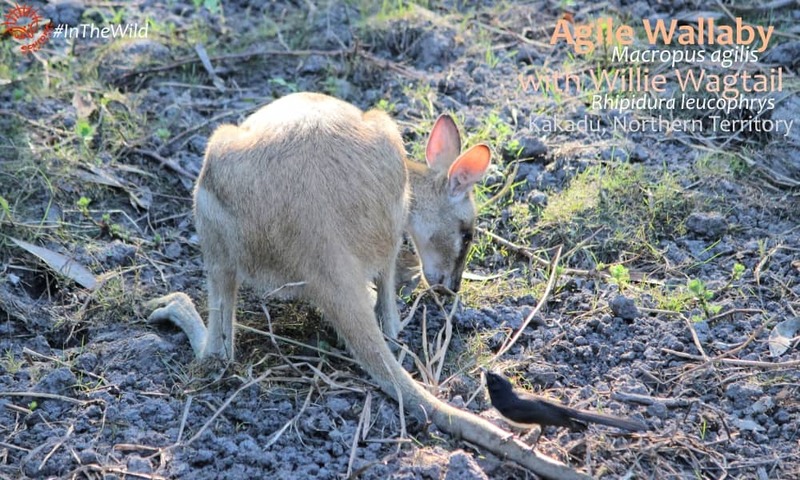 Willie Wagtails and Agile Wallabies both live in permanent home ranges – the wagtail’s is about 1 hectare, the wallaby’s is about 4 – so there’s a good chance they had met many times. These are my fairly poor photographs of this delightful encounter. Imagine what a good wildlife photographer could do! 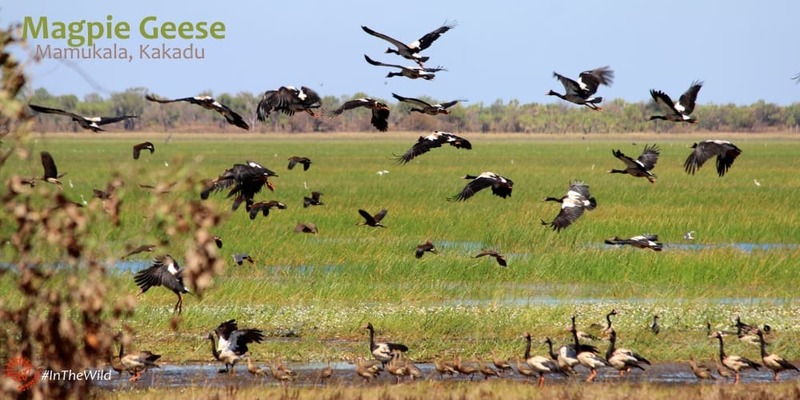 Our Wild Top End 6 day Kakadu and Mary River tour operates at a relaxed pace that allows for wildlife and bird photography. Multiple nights are spent at each accommodation, so we can take early morning and evening forays, broken by a return to the lodge in the middle of the day. River boat cruises are also part of the tour, and our Saltwater Crocodile photographs are just stunning! See some here. Another highlight is morning at Fogg Dam Important Bird Area.